Hydrogen from seawater; more bacteria conduct; where e-waste ends up. Engineers at Columbia University are developing an ocean-based photovoltaic-powered electrolysis device that can operate as a stand-alone floating platform to split water into hydrogen fuel and oxygen. State-of-the-art electrolyzers use expensive membranes to maintain separation of the H2 and O2 gases produced by water electrolysis. The new device relies instead on an electrode configuration that allows the gases to be separated and collected using the buoyancy of bubbles in water. According to the team, the design enables efficient operation with high product purity and without actively pumping the electrolyte. Based on the concept of buoyancy-induced separation, the simple electrolyzer architecture produces H2 with purity as high as 99%. Additionally, the membranes are prone to degradation and failure and require a high purity water source. Seawater contains impurities and microorganisms that can easily destroy these membranes. “We believe that our prototype is the first demonstration of a practical membraneless floating PV-electrolyzer system, and could inspire large-scale ‘solar fuels rigs’ that could generate large quantities of H2 fuel from abundant sunlight and seawater without taking up any space on land or competing with fresh water for agricultural uses,” said Daniel Esposito, assistant professor of chemical engineering at Columbia. The team’s PV-electrolyzer uses an electrode configuration comprising mesh flow-through electrodes that are coated with a catalyst only on one side. These asymmetric electrodes promote the evolution of gaseous H2 and O2 products on only the outer surfaces of the electrodes where the catalysts have been deposited. “Being able to safely demonstrate a device that can perform electrolysis without a membrane brings us another step closer to making seawater electrolysis possible,” said Jack Davis, a PhD student at Columbia. The team is refining their design for more efficient operation in real seawater, which poses additional challenges compared to the more ideal aqueous electrolytes used in their laboratory studies. They also plan to develop modular designs that they can use to build larger, scaled-up systems. 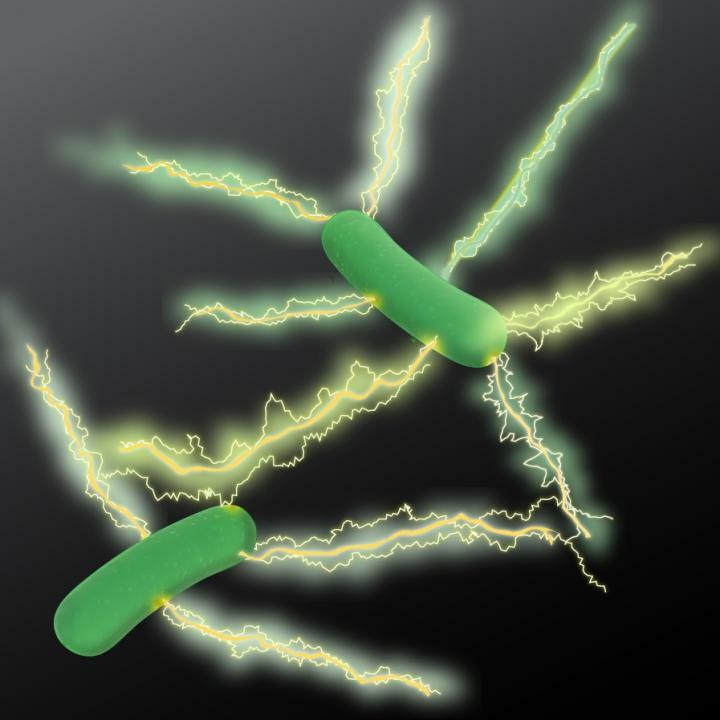 The bacterium Geobacter is well known for one unusual property: electrically conducting microfilaments that can act as nanowires. But they’re not alone, according to microbiologists at the University of Massachusetts Amherst, who have discovered the structures in many other species. “Geobacter have evolved these special filaments with a very short basic subunit called a pilin that assemble to form long chains that resemble a twisted rope. Most bacteria have a basic subunit that is two to three times longer. Having electrically conducting pili or e-pili is a recent evolutionary event in Geobacter, so the working hypothesis was that this ability would only be found in its close relatives,” said Derek Lovley, a professor at UMass Amhurst and discoverer of Geobacter’s electrical properties. The primary focus of the researchers was to develop a screening mechanism to determine which microorganisms use e-pili for extracellular electron exchange. They took native pilin genes out of Geobacter and replaced them with pilin genes from candidate bacteria, then placed this genetically modified organism into a microbial fuel cell to see if it would produce electric current. One particular application the team sees for the new bacteria is in biomedical sensors. What happens to old electronics? Finding out is an important problem. A new report from the United Nations University, the International Telecommunication Union, and the International Solid Waste Association says global electronic waste, defined as discarded products with a battery or plug, grew to 44.7 million metric tonnes (Mt) generated in 2016, up 3.3 Mt or 8% from 2014. For comparison, the UNU says the amount of e-waste in 2016 was equal in weight to almost nine Great Pyramids of Giza, 4,500 Eiffel Towers, or 1.23 million fully loaded 18-wheel 40-ton trucks, enough to form a line from New York to Bangkok and back. It’s expected that by 2021, e-waste will see a further 17% increase to 52.2 million Mt, making it the fastest growing part of the world’s domestic waste stream. Only 20% of 2016’s e-waste is documented to have been collected and recycled despite rich deposits of gold, silver, copper, platinum, palladium and other high value recoverable materials. The conservatively estimated value of recoverable materials in last year’s e-waste was €55 billion (about $66 billion). However, what happens to the vast majority of e-waste is unknown. 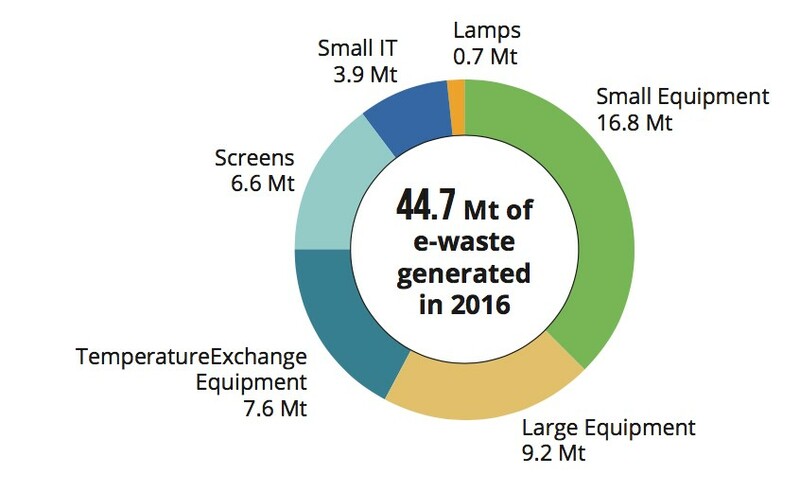 About 4% of 2016’s e-waste is known to have been thrown into landfills; 76% or 34.1 Mt likely ended up incinerated, in landfills, recycled in informal (backyard) operations or remain stored in households. The report warns that when e-waste is not tracked through legislation, it is likely treated as any other waste, leading to a high risk that toxic elements in e-waste are improperly managed, allowing them to seep into the environment or be scavenged for copper or gold without proper worker protections. Worldwide per capita e-waste generated was 6.1 kilograms in 2016, up 5% from 5.8 kg in 2014, which the report attributes to falling prices and rising incomes that make electronic and electrical devices affordable for most people worldwide while encouraging early equipment replacement or new acquisitions in wealthier countries.